Austrian manufacturer and philanthropist; born at Wescheraditz, Bohemia, in 1817; died at Vienna June 1, 1884. Pollak was trained for a technical career. 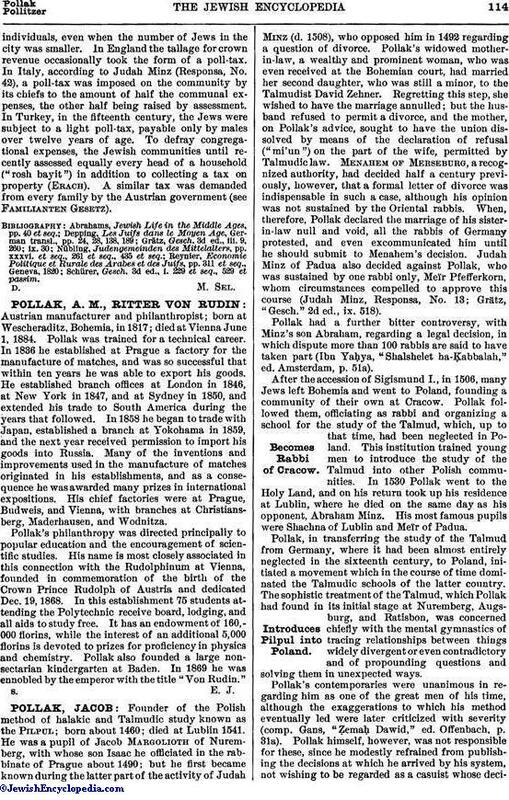 In 1836 he established at Prague a factory for the manufacture of matches, and was so successful that within ten years he was able to export his goods. He established branch offices at London in 1846, at New York in 1847, and at Sydney in 1850, and extended his trade to South America during the years that followed. In 1858 he began to trade with Japan, established a branch at Yokohama in 1859, and the next year received permission to import his goods into Russia. Many of the inventions and improvements used in the manufacture of matches originated in his establishments, and as a consequence he was awarded many prizes in international expositions. His chief factories were at Prague, Budweis, and Vienna, with branches at Christiansberg, Maderhausen, and Wodnitza. Pollak's philanthropy was directed principally to popular education and the encouragement of scientific studies. His name is most closely associated in this connection with the Rudolphinum at Vienna, founded in commemoration of the birth of the Crown Prince Rudolph of Austria and dedicated Dec. 19, 1868. In this establishment 75 students attending the Polytechnic receive board, lodging, and all aids to study free. It has an endowment of 160,000 florins, while the interest of an additional 5,000 florins is devoted to prizes for proficiency in physics and chemistry. Pollak also founded a large nonsectarian kindergarten at Baden. In 1869 he was ennobled by the emperor with the title "Von Rudin."